President Trump spent the first half of his term in aggressive pursuit of "energy dominance." Unless he wins a second term, Trump will have 21 months — or less, given the demands of a presidential campaign — to strike all of the Interior Department, EPA and other agency rules targeted in his "energy independence" executive order, which the president signed two years ago this week. "That EO was a really great start," said Mandy Gunasekara, a former EPA appointee who now leads Trump's political action committee. "The agency took it and has been applying it in earnest, and that work will continue as fast as practicable." After a couple of unsuccessful attempts to stamp out some Obama-era regulations, the Trump administration has begun to unveil proposed replacement standards for greenhouse gas emissions from energy operations and power plants. Some of those final revised rules should hit the Federal Register later this year. Last September, Trump's Bureau of Land Management locked in its updated rule for methane releases from energy activity on federal and tribal lands. The regulation, an effective rescission of the Obama rule it replaced, was immediately challenged in the U.S. District Court for the Northern District of California. The lawsuit, led by California and New Mexico Attorneys General Xavier Becerra and Hector Balderas, serves as the judicial system's first avenue to assess the merits, and not just the delay tactics, of Trump's deregulatory plan. "In the courts and in Congress, or at the polls, we have to fight for our agenda," said Becerra, one of the administration's key legal opponents, in his prepared Spanish-language response to Trump's most recent State of the Union address. In the last half of 2018, the Trump administration also released draft replacement rules for the Obama EPA's Clean Power Plan for the power sector and the agency's methane requirements for new oil and gas sources. A partial government shutdown earlier this year may have stalled release of final standards. 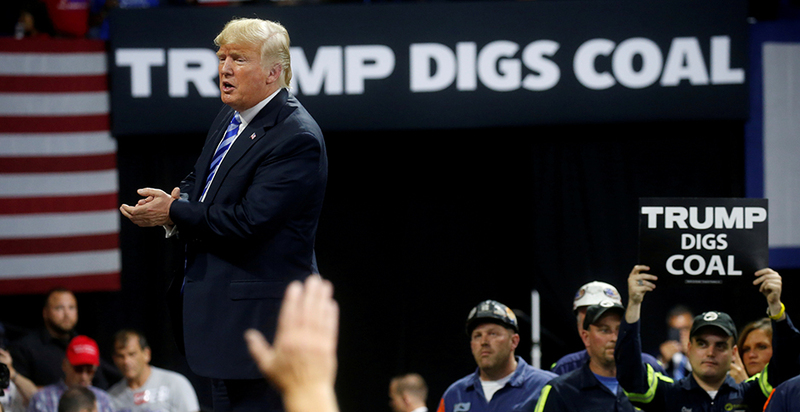 The president's efforts have been in service to his campaign promises to bring back coal and boost the oil and gas industry — a business whose booms and busts are dictated more by price than by federal mandate. Market realities muted the impact of Trump's order to cancel an Obama-era moratorium on coal leasing. Since Interior lifted the ban, just one day after Trump signed his energy order, coal companies have withdrawn applications for nearly 1 billion tons of coal. Unlike the cancellation of the coal leasing ban, the Trump administration will need to usher in replacement rules for the other policies targeted for repeal under the 2017 "energy independence" executive order. Here's a look at where the rollbacks stand. Rule watchers got their first look at Trump's Clean Power Plan replacement rule last summer. The proposed Affordable Clean Energy, or ACE, rule would toss the Obama administration's approach to greening the power grid and instead focus on emission-slashing technologies at existing coal-fired plants. A final rule is expected this spring. Lawsuits are guaranteed to follow. Environmental groups and some states are already plotting courtroom battles. EPA is still reviewing a sister rule on carbon emissions from new and modified power plants. A repeal or revision of those requirements would carry less weight, as industry has shown limited interest in building new facilities. The Trump administration has been hard at work unraveling Obama-era methane controls. BLM's revised Methane and Waste Prevention Rule is the subject of litigation in California district court, and final changes to EPA's separate methane standards could come down at any time. A proposed replacement for EPA's methane requirements, introduced last fall, drew fire from former agency officials, legal experts and the state of California. EPA's rule applies to new and modified oil and gas sources, while BLM's rule pertains to existing sources on public lands. Federal regulators haven't replaced all of the rules demolished in the wake of Trump's order. Interior completely wiped out Obama-era requirements for hydraulic fracturing operations and for the valuation of federal minerals. Litigation on both of those rescissions is still pending, and replacement rules are nowhere to be found. A new valuation rule could be introduced this fall, according to the administration's October 2018 regulatory agenda. The Trump administration appears to have spared two less controversial rules governing energy development in national parks and wildlife refuges. Another casualty of "energy independence" was the Obama administration's stay on new federal coal leasing. The cancellation is facing court challenges from environmental groups and tribal advocates. But while the Trump administration keeps saying the "war on coal" is over, the amount of federal coal up for lease has actually shrunk significantly since the moratorium ended. The downturn is driven by declining coal demand as natural gas and renewable energy capture a greater share of the electricity market. Most major coal companies already have years' worth of coal under lease. At the same time, they are losing customers as more coal-fired power plants close. Reporters Kelsey Brugger, Dylan Brown and Niina Heikkinen contributed. See below for an annotated version of the executive order, or click here for a PDF version. The order sets out lofty goals for promoting development of all types of energy, but its recommended regulatory rollbacks focus on streamlining fossil fuel development. This clause gives the order broader reach, prompting regulatory reviews from many agencies beyond EPA and the Interior Department. Some agencies, including EPA, the Interior Department and the Department of Energy, began to make their regulatory reviews public in 2017. The Trump administration has formally proposed repealing the Clean Power Plan and last summer unveiled a proposed replacement rule. The new source rule is still in effect. A legal challenge over the 2015 rule is stalled while EPA works on a replacement rule. The Trump administration’s proposals to replace the Clean Power Plan and BLM and EPA methane rules feature significantly reduced estimates of the social cost of emitting greenhouse gas. Interior lifted the Obama administration’s federal coal leasing freeze in 2017 but industry interest in new leases has been light. EPA tried but failed to stall the Obama administration’s methane standards for new oil and gas. The rule is now in effect while EPA moves forward on a broader rollback. Interior rolled back the fracking rule in 2017. A lawsuit filed by environmentalists is still pending in court. Interior has made no announcements on these less controversial rules. Efforts to repeal under the Congressional Review Act failed. After an unsuccessful Congressional Review Act push, Interior tried twice to delay the Bureau of Land Management’s methane rule, but both attempts were rejected in court. A revised regulation, which mostly rescinds the 2016 standards, now faces a challenge in a California district court.